Sometimes the combination of landscape and history is interesting and attractive. In this case, we have an insultingly blue sea, with an islet with green touches and above it a historic tower that recalls the convulsive times of frequent pirate attacks in the Mediterranean. An idyllic winter image that also offers tranquility and a unique silence that contrasts with the hundreds of tourists who come to visit this place every day. The shopping malls in Singapore are very useful even for those as me,who hate shopping.... The ultra high temperatures of this city island makes to get in one, a big relief and give the opportunity to chill out of such great temperatures. But also some of them offers great views of the city. Here we can see a strange mix of colours in heaven, due to the city is about to have a big thunderstorm as is common in this city on very hot days. one of the most beautiful squares in the world is located in the city of Samarkand in the republic of Uzbekistan and where the style of the thousand and one night is omnipresent. Arab styles with Iranian brushstrokes, the extreme symphony of colors in the buildings and the silence of the surroundings is a gift for the senses. The square of the Registan in Samarkand is the "summum" of all this and will certainly leave a mark on the visitor. The lakes, these kind of memories of the sea in the mountains, are essential in summer to refresh those who can not go to seacoast. But in addition they have different surprises, when they are in calm they reflect like a mirror everything that they see. In this case in the beautiful lake of the city of Annency in France reflected on the water the nearby Alps. Picture taken at Liukang Loe island at the south of Sulawesi Island. It´s really impresive how sunset time can change the landscape with the shadows and smooth colors that moment give to the earth... in this case the image shows large desert dunes with colors that make smooth to see the hard desert at a certain distance, the shadows and the shapes are extremely inspiring. This is what I feel when I see this picture taken from an aircraft shortly after take off from Labuan Bajo in Flores Island in Indonesia. The views reward me with a view of a heart, a blue heart, as blue are the waters here, a mix from the Indic and Pacific oceans and of course a great wide choise of great experiences... so, definately Asia is in my heart. Everyone has heard of the famous Sistine Chapel of the Vatican, one of the most visited places in the world. But with perhaps more merit for its antiquity, but much less famous are the basements of a religious building in the city of León in Castile (Spain) where it houses a much older and anonymous paintings that cover the basement of the Monastery of San Isidoro de León where the famous collegiate church is located. There some paintings that will not leave the art lover indifferent and where he will not be disappointed. Hated and detested by some but fascinating to others, arachnid animals are an example of intelligence in nature. Weave their nets with patience so that some unwary will fall into it and become a victim and food. On the other hand some spiders have bright colors that hypnotize and repel ..... and is that spiders have two faces, fascinating and repulsive at once. There is no doubt that the pool of the image is quite infinite for its great size and for its spectacular view towards the great city of dubai and its famous skyline. And it is that everything in Dubai is great and nothing seems to have limits that although this pool has them, thanks to the sea in the background it seems still bigger. Maybe this is the way many people think that is Dubai, things look like, but they are not. Coming back to it ten years after my very first visit, I found myself a bit disappointed due to the place deterioration, due to mass tourism, I remember once having enjoyed a spectacular silence in this place and a magical charm that perhaps never again will have again. Although it is a unique and unforgettable place, here it came true (in my case) this saying that says that the second parts were never good. It is the highest tower in Central Asia and was the third highest tower in the world. It measures 375 meters high. In its central part where the main area is, is painted with the colors of the flag of Uzbekistan. It is an amazing building that is practically visible from every corner of the Uzbek capital. Unreal, almost ironic, but it exists, although affected by the earthquake of last year and by a cyclone, but there they are all these kakku pagodas, somewhat affected but always ready to impress the traveler who enters these remote lands. And even more, just from a site you can have the prize to see it in a water reflection as in the image. Water, Earth, Air, and Fire are the four essential elements for living. In the image the water covers most of the image and on our planet the 75 percent of the surface of the planet is water (does not make sense to call it Planet Earth, but should be called water planet). The air is also present in the image since that day was clear and had a lot of visibility although it was present a breeze that made the sea move capriciously. The earth here is present in two places, the sand of the island that ends and in the background another island visible from that point, and we lack the fire that is also present but not directly visible in the image (or yes), the Sun, since without it (which is actually a majestic ball of fire) we would have no image and there would only be darkness in that picture. Possibly the "fontana di Trevi" is the most famous source in the world. Located in the center of the city of Rome, which is the same as saying one of the most romantic and historical cities in the world, owner of an ancient and superpowered empire and where today we can still feel the echo of the past walking its streets. Its construction lasted 11 years, its name TREVI means of the three ways, its main statue represents Neptune, ah! And very important, your water is not drinkable. Picture taken in Rome, just in front of the "Fontana di Trevi"
Not everyone sleeps at night. In nature there are some animals that live at night and sleep during the day. Some very curious because they also sleep upside down, and many of these specimens even move their wings while they dream. Their appearance is strange to us but they are about noble creatures, and some are large in size. Let them rest since at night they will hunt for the insects that annoy us so much. Contrasts as in real life. The sea in the background, a big parasol in a side and a swimming pool and inside it a woman with veil. Controversial image in one part of the world and normal in another .... such is life... life is full of contrasts ....! The great dame of Paris, the most famous, the most universal, is made of iron. Its maker was Gustav Eiffel, and is the most popular icon of the most romantic city in the world. Of course, sometimes you see it up close, from very close, and certainly has its drawbacks and one sees a large bunch of irons, a chaos of cables, but yes, from there, you get the best views of the city of light. Worth the climb. The south of India is surprisingly very christian land, although there are many people with hinduists believes. But is striking how the churches appears on the scenary, in this case (picture above) from the very top of a lighthouse in the city of Cochi, where this picture was taken. The great Miguel Angel was a versatile man and certainly has left a great cultural legacy in the World, in some places as Florence and also in Rome and specifically in the Vatican City where some spectacular works exist, perhaps the most emblematic is the Sistine Chapel which is also the place where popes are elected. Coming to this place and looking up is to give oneself an injection of Stendhal syndrome. Someone told me that the GendarmenMark Platz in Berlin is the nicest Square in Europe. May be it is or may it is not, but certanly is beautiful indeed. The two domes in both sides and the magnificent concert hall in its center makes of this place with french origen name, one of the "must" visiting place in Berlin. IS THIS MARS OR VENUS? At the bottom of a very impressive cliff, there´s a hidden secret that anyone can discover if is willing to accept going downstairs on a way with such amazing views facing the Mediterranean sea, and get down more than 600 steps. This cave was visited by one of the former italian kings, and nowadays is visited by many tourists, especially on summer. Anyway is nice sometimes discover the inner side of the earth and the thousand years formation of its rocks. It is true that all the buildings and therefore the island, have an unmistakable cream color, because their buildings are built with stone from the island that is produce in its many quarries. That gives a characteristic color from yellow, orange or cream in the case of this photograph that contrasts in an obvious way with some details in blue, such as a road sign or the bottom of a niche for a religious image. Typically Maltese, no doubt about it. the 1st of September 1,730 between nine and ten at the evening, the earth opened in Timanfaya, two leagues from Yaiza, and an enormous mountain rose from the bosom of the earth. The land was completely transformed. This chronicle is the beginning of the story of volcanic eruptions that occurred in Lanzarote and were written by the priest of Yaiza. These volcanic eruptions lasted six years. Ten locations were completely buried by lava, but fortunately no casualties and everyone could leave the area. barefoot and alone, the monk returns to his monastery. Monsoons drop heavy rain in Sri Lanka, but the monk goes his way, under the downpour. The colors of their clothes and umbrella contrast with the green background and floor. Decades ago, the cities were created with houses and little buildings, but from the 60th to nowadays, every time more cities are competing to have the biggest buildings and the most smart ones, The world has created megacities full of concrete and glass, Thus everytime we are living in an artificial world where the nature has a limited place, but this is the reason why the citizens of the biggest cities at the slightest chance, they flee to discover the nature where our ancients were living in. Blue is the predominant color on this planet. The sky and sea are blue, but there are places where the blue is really impressive. This is the case of this photograph taken during a winter in one of the most famous beaches of Ibiza. That day the intense blue turquoise was easily visible here, as it is during the sunny days of winter. There is no red carpet on the arrival, but no need. The wooden small promenade makes perfect background on this stage surrounded on bright blue sea, and some huts at the end on fantastic white sand. Definately is the arrival at the paradise. And again comes the heat, the sea, the beach and colors. The warm, sunny and long days have come again with the musical evenings and quiet nights (or not). Far away are the dark and long nights with the short and cloudy days of winters. Almost without realizing it, the autumn will call our door again and so the winter will return to us .... and again will have added another cycle to life. The green color is the colour of balance, harmony... it is said that is the colour of the emotions, the renewal, the spring.... Actually is the color of the nature, almost all plants and tree are green. Of course the green reflected on the lake or with a strong background of light is even more spectacular, giving a magic touch. I took this picture in Sri Lanka, but I can´t remember exactly where, but somewhere in the middle of the island. But anyway is a picture that gives to my soul a sense of peace. The lotus flower is considered the most sacred of flowers in Buddhism and where tradition says it is symbolically where Buddha was born. We must pay close attention where Buddha is sitting, as it usually does on a lotus flower. The lotus flower means spiritual purity, or the purity of body and soul. Legend has it that when Buddha was a child, where trod bloomed lotus flowers. The muddy waters from which they spring means attachments in life and carnal desires but its flower above those waters means the pursuit of light and spiritual elevation. There are different colors in the Lotus flower, but the most important is precisely the rose, like the image. This image of the Virgin Mary is located on the side porch of the Cathedral of Palma de Mallorca. It is true that is to emphasize its great beauty, but lacking the nostrils, due to impairment because of the time and that not always the porch was well preserved in the past, and although the original statue is in a museum (the one of the picture this is a copy that was made in 1917) there is no doubt that this is one of the most beautiful Gothic images that represents the Virgin Mary. In the good books of Gothic art always appears this image, but it seems that is like that in the gothic is difficult to classify. An image that is very expressive and that stands out from all others. There is always a reason to light a candle. Its a hard work, entertain on the streets on winter. But here she is, challenging the cold, with fire, which sure warms something the ambiance. Around her the curious who want to see her skills and her juggling her concentration and her ability. After the performance, she will ask some coins to the people who enjoyed her show. The chapter of the Jesus Christ Passion is celebrated in Spain with passion (passion all over) in some places on a more humble way, but in others with never ending processions as in Andalucia (south of Spain). In other less known sites as Castille (Zamora, León, Segovia.....) the holy week celebrations are declared as of tourist interest. They are celebrated on a very sober way with many ancient and espectacular carvings. The silence wraps all. And then, there´s a middle way on the celebrations in the mediterranean coasts, and in some little parishes just they make a little procession where they sing a very old holy hymns relating the passion, as they do in the little island of Ibiza, where the crowds of the summer have not yet arrived. I do not remember exactly in which square in Rome, I took this picture, but I think it was in the Navona square in front of the Basilica of St. Agnes and just next of the very impressive bernini sculpture located at the center of the square, where there is always a significant number of people wandering around that landmark and where one of the many pampering was getting ready, giving the final touches to his make up. awaiting another exhausting day to harvest some coins from the public. I was walking around Rome when I got on an elevator to the heights of the city and in a nearby building I saw her, there she was. A sly seagull which she also was enjoying the fantastic views of the eternal city, concretely the views of the Roman Forum and farther we could also spot the Colosseum. His gaze was defiant, mischievous and arrogant ... But she let me photograph her (it) and here is the result. A seagull enjoying Rome, with a suspicious gaze. Picture taken at Victor Emmanuel II Memorial in Rome. The orange is the colour of the Buddhism, actually also are the yellow and the red, and the orange is on the half way of both. The orange is the colour of energy, happiness and triumph, but also the danger is generally shown in this color. 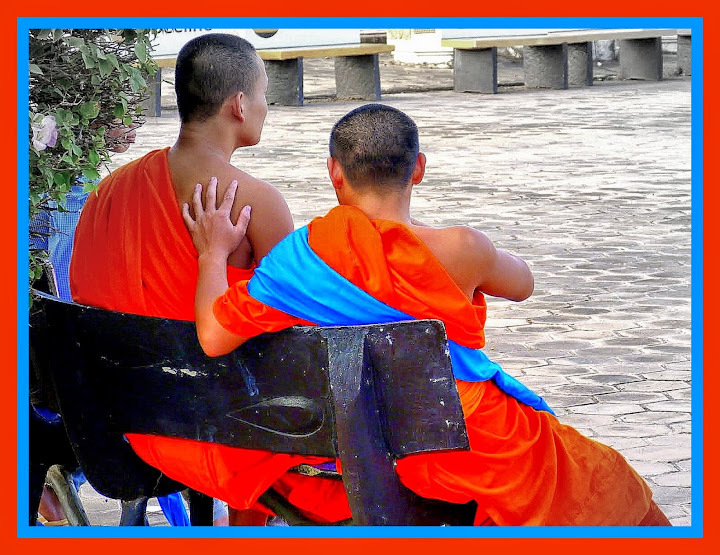 Sunsets are normally orange, The orange color in the buddhism represents the ilumination, Actually is a hint of colour in the introspective life of these monks. Today is a good day for this fisherman. The weather is wonderful, the sea is relatively calm, and it seems that today is a good day for fishing, he fishes right now one big fish from the sea, and so he smiles, and sure is not the first one he gets and neither the last one. the scene seems very colorful, the blue sea and a multi color boat. those maltese boats full of colours with the Isis eyes in front of each one. Really a colorful and happy scene. May be its a bit distance from the center of Paris, but it worth a visit. I always wished to visit Montmartre in my fast trips to Paris and at the end I could do it. The best views of Paris are here,from the church of "Sacre Coeur" and if you go up the dome even better, really it worth it. But a walk around the streets is paramount to enjoy another Paris, the bohemian Paris, the ancient Paris, the ancient mills, the ancient establishments, meanwhile the big city is under our feet. Definitely is a unforgettable visit and an incredible sunset, if visiting late in the afternoon. Montmatre district seen from the top of the Galeries Lafayette (Paris). The inca trails spanning six countries, are declared world heritage by the UNESCO in their committee celebrated in Doha in June 2014. the trails of more than 6.000 kilometres, linking six countries, Argentina, Bolivia, Chile, Colombia, Ecuador and Peru, have a distance of 6.000 kilometres. Was the only way to reach the Machu Pichu, in order to supply goods in that ancient city. Machu Picchu, and the city of Cuzco were already declared "World Heritage" in 1983 by the UNESCO. Incredible heritage, unbelievable culture. Nowadays the time is very important, also for the buddhists. So, instead to walk under the hit at 38ºC, is more intelligent trying to stop anyone who wants to transport a monk to his destination. So that is what was happened in one of the main routes of the Siem Reap center. That day that monk was lucky and any transportation mode was good enough for him to avoid walking. That day he was quite lucky. In the small but beautiful city of Girona, there is a colorful bridge that inmediately catches the eye, above the river onyar. Absolutly in red, combined with the many buildings surrounding the area, painted in different colors, resulting as a nice colorful place. Turns out that red bridge was built by Gustave Eiffel company in the year 1876 and today is one of the symbols of the city. It also known as "de les peixetaries velles Bridge", which means old fishmongers, but is more easy to call it by the Eiffel Bridge. By the way if you have not visited yet Gerona, I can say it is a cosmopolitan, beautiful, amazing, historical and wherein further fine eats. A really charming place. When the Iberian peninsula was still a Muslim land, this architectural wonder which is currently considered one of the ten most impressive and breathtaking monuments in the world was built. Different palaces and summer residences form a site, that was most appreciated by the "generalifes". A great fortress city with a wonderful view. Currently is the most visited monument in Spain and the UNESCO declared it a World Heritage Site in 1984. It´s located in Granada (Andalucía) where also are buried the former Catholic Kings of Spain in the Royal Chapel of the Cathedral. Two reasons to visit this beautiful city.